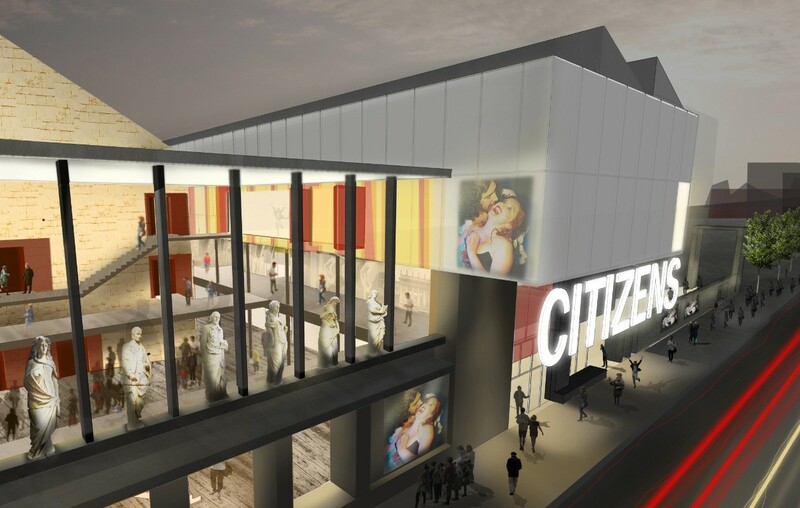 Glasgow’s Citizens Theatre has secured a £4.9m of earmarked funding from the Heritage Lottery in support of its redevelopment, paving the way for a formal planning application to be submitted. Overseen by Bennetts Associates the overhaul will provide contemporary facilities whilst retaining the Victorian auditorium and theatre machinery; including a unique paint frame that continues to be used to paint backcloths. This will see 20th century additions removed and replaced together with the creation of a new foyer , studios, workshop, offices and catering. Accessibility will also be improved with lift access introduced and public viewing windows installed to expose historic machinery. Work will also be undertaken to archive and open up the theatre’s collection of artefacts, materials, pictures, literature, scripts and costumes will be centralised and catalogued for the first time. 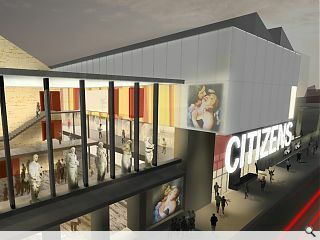 Most prominently however the theatre’s exterior will also be remodeled with the return of statues of Shakespeare, Burns and the four Muses salvaged from the original 1878 façade.